It’s an Equine Line. They do it a lot. They sleep in lines, walk in lines, graze in lines. 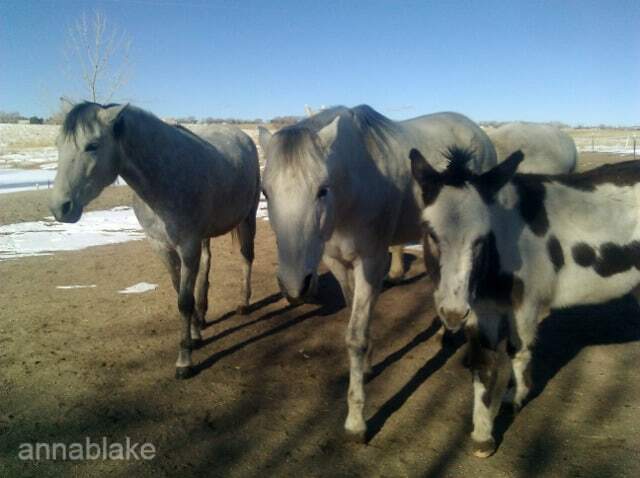 Here two horses walk with Edgar Rice Burro, an equine cousin, trying to look as much like him as they can. Same ears, same eyes. Edgar is a bit of an inspiration around here, not just for his breakout skills. If you take a step back, either in time or space, the line becomes part of a larger Pattern of how a group lives and moves. It’s an organic quadrille, part of the comfort of being a herd, a pack, or a flock. Humans aren’t so different, even when we try to be. Lisa, not sure I saw the pony picture, but your websites are lovely! Wow, what a great tribute to the way humans and horses alike interact with conformity and group values. Love the photo.